Sean Cavanagh has confirmed he wants to continue playing for Tyrone in 2016. 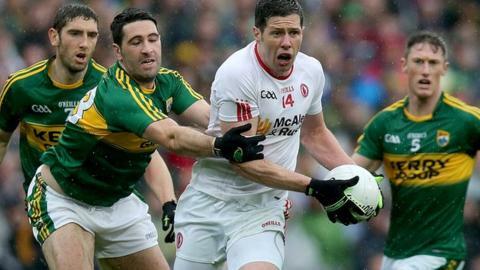 The Tyrone captain, 32, insists he has no plans to retire in the wake of the county's All-Ireland semi-final defeat by Kerry in Croke Park last month. Cavanagh is Tyrone's longest-serving player, winning three All-Irelands and four Ulster titles since making his debut in 2002. He expects manager Mickey Harte, who is in discussions with the county board about his future, to remain in charge. Speaking to the Daily Mirror, Cavanagh said he wished to play on "as long as my body can hold out for another season". "I feel there is a good team in the county at the moment and a team that is capable of challenging for honours. "If my body holds out and the management team wants me for another year I'll certainly make myself available." He believes Mickey Harte, whom he has played under since 2003, will still be in charge next year despite recent doubts about his future. "We didn't have any major silverware this year but in our eyes we had a pretty good year and feel we're building and can challenge for trophies in 2016. "I don't foresee a change in the management, but at the same time, it's not within our hands. "It's the county board's job but I suspect that he will still be in charge in 2016."